Categories: Crossword, For Kids, Family, International. Wouldn't it be great to have various members of the family all solving the same puzzle? 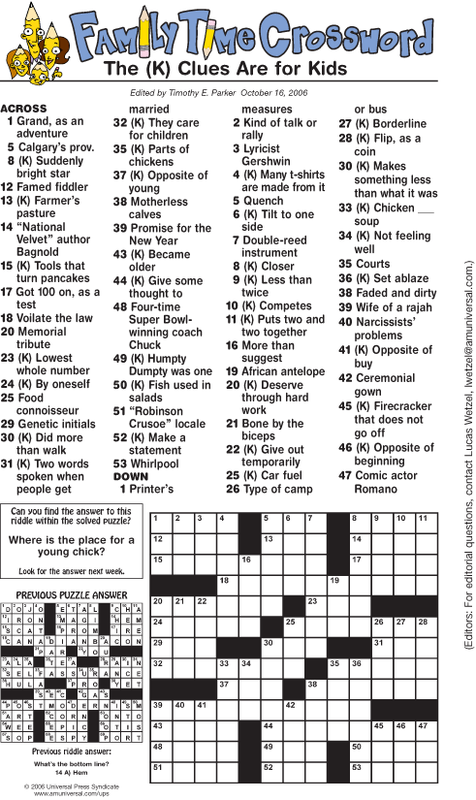 That's the idea behind Timothy Parker's latest syndicated puzzle, the Family Time Crossword. The puzzle is a professional, symmetrical puzzle that features clues for both adults and children. The kids' clues are denoted with a (K) and are purposely clued for their level. This puzzle is a great way for parents, grandparents, guardians, teachers, etc. to interact with kids in a fun setting and work together to reach a common goal. The whole idea centers on quality family time; something needed now more than ever. Puzzle master Timothy E. Parker has been named the World's Most Syndicated Puzzle Compiler by Guinness World Records. He is the editor of the USA Today Crossword and creator and editor of the Universal Crossword, one of the Internet's most popular crossword features. Parker's puzzle audience is one of the largest in the world. His work has been published in more than 80 countries, including the United States, Canada, Great Britain, New Zealand, France, Turkey, Russia, India, Saudi Arabia and the Philippines. His puzzles and games have appeared in hundreds of publications including the New York Post, New York Daily News, Dallas Morning News, Miami Herald, Boston Globe, Baltimore Sun and Toronto Star. In 2002, Parker edited the first crossword puzzle to appear in the 80-year history of Reader's Digest magazine. He has created content for corporate clients like Disney, Coca-Cola, Nike, Microsoft and the Smithsonian Institute, and has authored more than a dozen puzzle books. In 2007, he helped to produce the game show "Merv Griffin's Crosswords," single-handedly writing all 225 episodes, and he has several other television projects in the works. Parker, an ardent baseball fan, lives in Maryland with his wife and two children.